I even bought her a snorkel so she’s been practicing with that. Didn’t take her long to get the hang of holding her breath to dive with it and then blowing out the water on surfacing. There’s plans afoot for an unschooling camp on an island near Bali next year, so we’ll get to practice a lot more! Fun! Since my friend, T, is feeling a bit better, we went to the beach for the afternoon yesterday. Then she went exploring on the beach, finding cool coral and hermit crabs and interesting stuff. Ah, it’s a hard life! Since we’re back in Phuket, we had to make our traditional pilgrimage to the Japanese all-you-can-eat buffet place, Oishi. (yep, we love this place, remember it from HERE and HERE). Luckily it’s right next door to the fancy hospital my friend was staying in. Littletree was so excited, we could easily eat there every week forever and ever! Littletree and I landed in Phuket, tired after a long day. Thankfully, we were greeted by a driver standing with one of those little signs with my name on it. 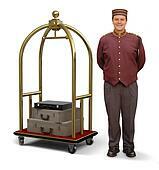 Relaxing in the air conditioned car, we pulled up at our destination where a bellhop in a shiny uniform greeted us in front of an imposing edifice, a large brass baggage cart in hand. We were guided to my client’s suite by an elegantly-dressed concierge who swept through the expansive marble-floored lobby, past the gift shop selling expensive trinkets and overpriced luggage, numerous little boutiques and beauty counters advertising specials on facial treatments or dental whitening, and to the elevators. The suite was quite large with all the mod-cons and a massive garden balcony. I headed straight for a hot shower in the marble bathroom and then ordered dinner from room service before laying down on the sofa for a rest in front of the big-screen TV while Littletree played on the wifi. Only this wasn’t a 5-star hotel but a fancy private hospital. Kind of fun for one evening taking care of my client, she is very sick, but we’re back at her house now, and she’s feeling better. Change of Plans–it’s a Wild Life! Majikfaerie to the rescue! Just when we decided to change our tickets and go home early, a good friend contacted me asking if I can come to Phuket and help her out. Littletree was really happy at the prospect of spending a week or so in Thailand, especially since we’ll be staying at a house with a private swimming pool. So off we go! She’s such a sweet little critter; apparently it’s really rare to see them as they’re very shy of humans, but Wasabi was rescued as a baby and hand-raised by the owner of this resort, She’s returned to the wild now, but still pops in for visits. We also had another surprise guest – a massive scorpion! So glad not to accidentally step on that one in the night! Yesterday I spent the afternoon following Littletree around this magical garden just up the road from us. It’s actually an organic plant nursery, but they have several acres of amazing gardens full of hidden, winding secret pathways. Yep, it’s a hard life alright, but someone’s gotta do it! And still, Littletree is bone-crunchingly homesick. I’m starting to consider changing our tickets to go home early, but it’s really expensive – $450 for both of us – yikes! Okay, I need help, Quick! As some of you may or may not know, I’m actually crap at making decisions. I um and ahhh over things for *hours*. okay, for days and days, irritating everyone around me. My tried and true method of making decisions (other than the multitude of craziness we all remember from when I won the iPad) is to ask my friends. The few friends I now have left will attest to this. I go over and over stuff, weighing up pros and cons ad nauseum. And in this very moment, I have a massive choice to make… and no friends around to ask! Purple is off at a rainbow gathering somewhere in Queensland, no one else seems to be online… and I’m in Malaysia! So, I’m asking the help of the internet-at-large: please please please help me design my new kitchen! (not sure if I mentioned it, but while we’re away, our kitchen is getting re-build). The actual walls are in thick black. Don’t worry about the thing that looks like we have 2 ovens – one of them is mis-labelled and will actually be a “dishwasher”, but I’m installing the laundry machine there instead, just because I’m cool and European like that. The question is about THE ISLAND. (ignore all the faint green lines that indicate the sizes of things, and focus on THE ISLAND! it’s to be 1350mm wide (53” for Americans) (not 1300 as shown) and 2100mm long (82”), and yes, it’s curved on one side, with barstool seating around the curved edge. So, See how the island sticks out past the dotted line that represents where the edge of the kitchen *was* (there was a half wall and bench here before, but now it’s gone – just lovely open space). The choice is: Do the island as shown, OR cut out the “300 base” (which is 300mm – 11.8”) and shorten the whole thing to 1500mm (60”) OR change the 300 base to a 400mm base (15.75”), thus making the whole island 2200mm (86.5”). Less island, which doesn’t stick out so much, but I just loose storage space and seating space, or more island, more cupboards and more seating space, but it sticks out past the “kitchen” space and into the “living/ dining” space 640mm-740mm (25”-30”). I can also change the configuration of all the cupboards in the island, but let’s don’t go there! Hippy Bath Day to Me! Yesterday was my birthday. Admittedly, the least interesting of all my birthdays ever, but still, it was a nice day. Littletree is feeling more settled in now, and talking less and less about wanting to go home – I bought her some food she is more familiar with, and she met a bunch of kids who live in the neighbourhood. and of course, playing with the kittens! Right now she’s lying on the bed next to me reeling off a list of all the things she misses so much from Australia. Tinned spaghetti, chicken nuggets, the fish and chip shop in Mullumbimby, chocolate-flake cereal, bread and nutella, flan, the porridge the Purple makes, Shakshuka that Purple makes, rice porridge, semolina, wafer biscuits, sausages… the list goes on and on. I pointed out that most of those things we can get or make here (and funnily enough, most of those are things she rarely has anyway!) but I guess that’s not the point. What she really misses is being at home. She misses the comfort of having familiarity. Me too. I’m happy to be traveling, and the place where we are staying is wonderful… but it’s not home. Funny, how after all those years of traveling, and not having any stable base or ties to anywhere, I’d find myself not only having a home, but feeling attached to it. I miss having my own kitchen, and my own space. I miss Ariad and Purple. It’s strange to be queer in a country where homosexuality is illegal. I admit to taking advantage of my privilege of marriage, and being closeted; not mentioning aspects of my life that are very dear to me when we’re in public, or with strangers. It’s strange to be in a country where Israelis are banned. We have to be quiet about that too. So, what can we do to overcome homesickness? We try to keep up our routine. We practice capoeira every day, we spend lots of time cuddling, Littletree watches her favourite DVDs, we talk with our friends and family on Skype, Littletree plays with the new kittens a lot. And I remembered I have a secret stash of Shkedai Marak (Israeli soup crackers) that Littletree loves. I just pulled them out and she got all excited! Now I just have to make her some soup to go with them. Tomorrow I’ll go to the big supermarket in the city that’s an hour away and try to get some comfort foods for Littletree, and we’ll plan some more fun activities and outings. I’m sure we’ll be home before we know it! Littletree and I arrived to Malaysia safe and sound :) We left Bangkok for the airport early, to pick up my luggage which finally arrived – just in time to take our flight to Kuala Lumpur. I was so glad to get my backpack back, intact, with all my birth kit! We landed in KL at around 9:30pm, then the slow dawdle through customs and immigration, waiting at the luggage carousel (thankfully, lightning doesn’t strike twice and all our stuff was there)! Then it was an hour on the shuttle bus to the city, we got slightly lost and waited a while for our ride, and finally another hour to drive back to the place we’re staying. It was nearly 1am when we arrived – exhausted! In the dark we crossed over a little footbridge with the sound of water rushing underneath. In the darkness, a little bamboo “chalet” was dimly lit, and we were ushered up the stairs into our room. Mmmmm a lovely, soft bed encased in mosquito netting. Ah the bliss that is horizontality! Our room is lovely; simple and comfortable. Here is the chalet from the outside with it’s little living area downstairs. Such a beautiful place, and the smell of fresh durian wafting on the breeze! Littletree and Purple arrived to Bangkok early yesterday morning – with their luggage. We spent the day walking around, eating yummy food, buying nice clothes and looking at cool stuff. The latest craze on Khao San Rd is “fish spa” – you sit with your feet in a big tank of little sucker fish and they nibble all the dead skin cells off your feet. Littletree loved it, though she could hardly bare to keep her feet in the water for any more than a few seconds at a time. It really feels freaky, but my feet did, at least, get really clean – very welcome after I’d walked around Bangkok for a day barefoot since my sandals are in my backpack that never arrived off the plane! It was quite an experience – definitely worth trying! I arrived safe and sound to Bangkok after a long and boring night flight, only to discover that my luggage didn’t fare as well. Apparently, my backpack went to Hong Kong. I always knew that one day my backpack would be old enough to go traveling without me and off she’d go. It’s just part of being a parent – our children aren’t our own, we’re just borrowing them for a while. Like with anything one borrows, the idea is to take good care of it and return it in good condition, preferably with a full tank and the oil and water topped up. Still, I hadn’t expected my bag to fly the coop so soon; after all, she’s barely two years old! The good people at the airport baggage services counter assured me that should my backpack be recovered, it will be returned to me. But like any runaway, one can only hope that after a crappy night or two out in the cold, they will come back – sadly, many of them are never heard from again. I would very much like to see my backpack again, because there’s no way I could replace my fetoscopes and stock of herbal tinctures and other assorted midwifery whatnots before I will need them next. And spend an evening drinking a beer on Khao San Road, watching the people go by and chatting to interesting strangers. Backpack, if you’re reading this, please come home; everything is forgiven and I promise never to over-stuff you again!